Wednesday March 23 1910. Will went in to get Charlie Merrifield to do the work at the house. I was down there a couple of times. and did a little mending and got the meals. Thursday March 24 1910 This would have been Father's birth-day. I was down to the house a couple of times to see about the work. Will plowed the garden and hauled a couple of loads of sand to put on it. I did not feel very well. Fannie got home today Friday March 25 1910 I felt better and it was some cooler so I washed and did a lot of scrubbing and part of the ironing Merrifield finished the work so Will took him in town in the afternoon with the paper to return. 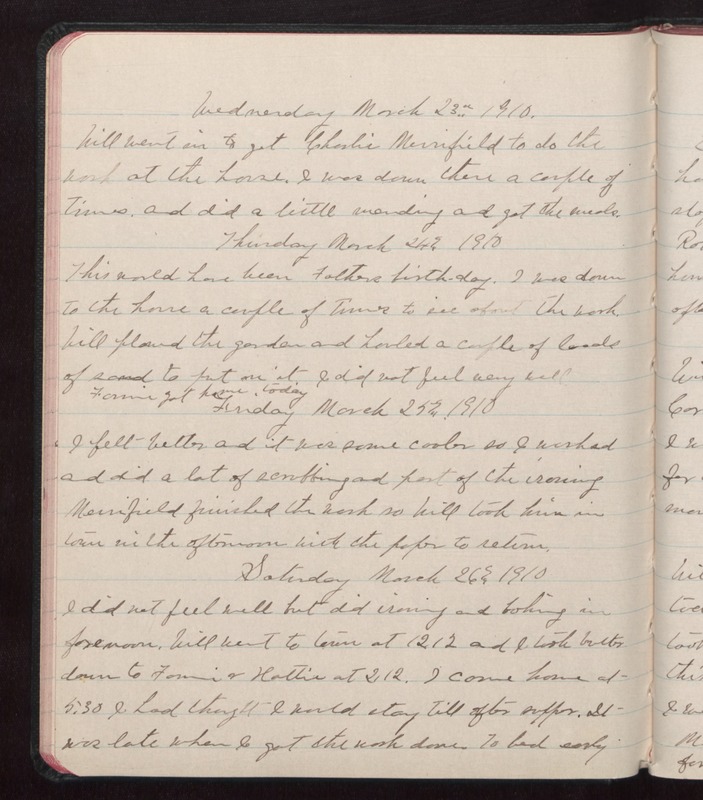 Saturday March 26 1910 I did not feel well but did ironing and baking in forenoon. Will went to town at 1212 and I took butter down to Fannie & Hattie at 2.12. I came home at 5.30 I had thought I would stay till after supper. It was late when I got the wash done. To bed early.